Parsnips are a root vegetable that many gardeners harvest in the autumn for eating over the winter months. The biggest challenge in growing parsnips is waiting for the harvest. Gardeners growing parsnips often sow them among the first vegetables in the spring and harvest them among the last vegetables in the autumn. Find a sunny spot in the garden to coax along your parsnips throughout the growing season and you will have a plentiful parsnip harvest in the autumn. Work the soil in the autumn before winter to prepare for spring parsnip planting. Use the garden spade to work the soil down to a depth of at least 8 inches to ensure that the parsnips grow straight into the soil. Add approximately 2 inches of aged compost to the top of the soil and work this into the soil. Aged compost is important because fresh compost may make the parsnips fork as they grow in the soil. Rake the soil surface smooth and leave the growing area over the winter. Till the growing area again in the spring as soon as the soil can be worked. Use the garden spade to break up the soil and remove any stones or debris from the soil as you find them. Work until you have finely tilled the soil. Plant the parsnip seeds in a row under 3/4 inch of soil. Space the seeds 2 inches apart and space the rows 1 foot apart. Pat the soil down firmly and water the seeds carefully after planting. Place a small marker at the ends of your parsnip rows so you remember where you planted the parsnips. Watch for the seeds to germinate 3-4 weeks after planting. Remove any weeds as they appear. Thin the seedlings when they are 2 inches tall so that the strongest parsnips are spaced 8 inches apart. Keep the seedlings evenly watered and continue to remove weeds by pulling them by hand. Loosen the soil around the parsnips with a small garden fork to harvest. Insert the fork into the soil surrounding a parsnip and push the fork down and under the parsnip. Carefully lift the parsnip up and out of the soil and then repeat this technique with the next parsnip growing in the row. The bottom of the parsnips may be as deep as 6 inches under the soil, so make sure you dig deeply to get completely under the parsnips. Trim the greens from the tops of the parsnips immediately to prevent the roots from withering. Leave parsnips in the ground until after some autumn frosts have occurred. This will produce parsnips with the most flavor. Remove all of the parsnips from the ground before the ground freezes in late autumn or early winter. Store parsnips over the winter by placing them in a box filled with sand or peat moss. Cover the box and place it in a cool, dark location for several months. 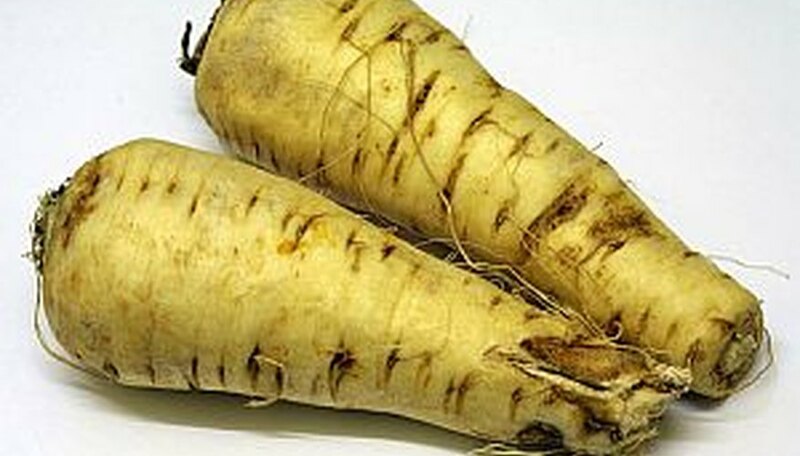 Do not plant parsnips seeds over 1 year old because older parsnip seeds will not germinate.